St. Helena wasn’t always just the cute, hip-meets-hippy town one happened to drive through on the way to Yountville. No, back in its prime, St. Helena was where you stopped, had dinner, maybe stayed a couple of nights at a bed and breakfast, so you could stroll around the main square with your hot morning buns and cup of coffee. Farmstead Restaurant and the Long Meadow Ranch tasting room, a new venture from the people who own and operate the Long Meadow Ranch, might be what makes St. Helena a destination again, not just a picturesque pit stop. 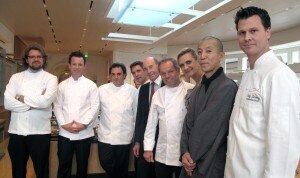 Michael Cimarusti, Providence; William Bradley, Addison; Josiah Citrine, Melisse; Tony Esnault, Patina; André Gayot; Wolfgang Puck, Spago; Sophie Gayot; Hiroyuki Urasawa, Urasawa; Craig Strong, Studio. Photo Walter Mladina. For the just released 2010 Restaurant Issue, we gathered seven Southern California chefs who all earned a spot on our Top 40 Restaurants in the U.S. list. The photo was taken at CUT restaurant in Beverly Hills to celebrate Wolfgang Puck, who was also honored as our 2010 Best Restaurateur in the U.S. Besides the Top 40 Restaurants, we also reveal the Top 40 Cheap Eats, and much more. You won’t believe what we have to say about Food Trucks! We’re happy to publish your thoughts on our 2010 Issue in our Forum. Some of our best childhood memories include coming home on a frigid day and entering a warm home scented with the savory smells of the kitchen. Oh, the irresistible smells of pot roasts and winter stews left to simmer all day, or a roasted chicken crackling in the oven. The smells of a pot of meat are not to be underestimated. But we’re all adults now, so the only way to recapture that feeling is to do it ourselves, or to find someone to do it for us. 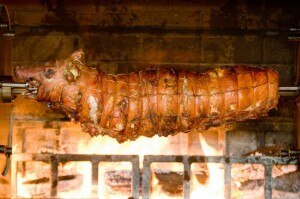 In an attempt to reconnect people throughout the Bay Area with their warm and fuzzy childhood memories Sausalito’s Poggio is offering two very meaty specials both priced under $20. 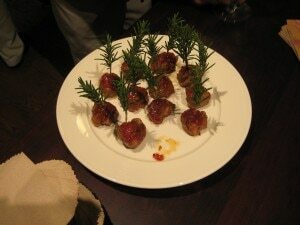 Not every Italian chef is a pasta fiend. 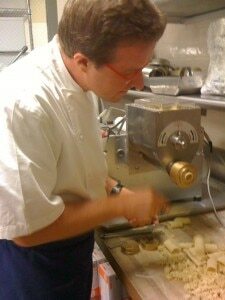 But executive chef Alessandro Cartumini of Quattro Restaurant at the Four Seasons Silicon Valley at East Palo Alto, CA can’t do without his $10,000, 1.5 horsepower engine P.Nuova pasta machine. He refers to it as the “Ferrari of pasta makers,” and it churns out 40 pounds of pasta per hour: gnocchetti, sardi, bucatini, and shapes that resemble miniature crowns and luxurious ribbons of festonata; and the to-die-for beautiful crestas, resting in velvety, slightly spicy tomato sauce; mouth-watering spinach ravioli topped with fried sage; and a gorgeous rigatoni stuffed with pork and served with poached cherries. Sometimes, kitsch just works. 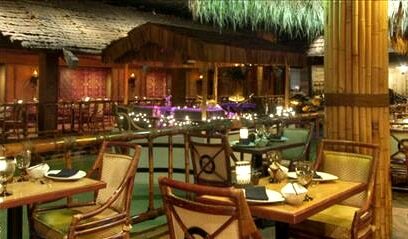 At the historic Fairmont San Francisco, much of The Tonga Room & Hurricane Bar is covered by the hotel’s old swimming pool, which now features a floating bandstand. Allegedly, Ronald Reagan is among the famous people to have taken a dip in it.